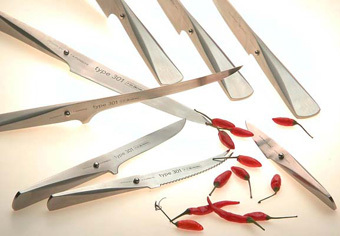 Type 301 knives, designed by F.A. Porsche with top chef Jõrg Wörther, are beloved among top gourmet chefs around the world. The blade is made from special high-class pure Japanese 301 Molybdenum/Vanadium stainless steel and hardened to Rockwell C56-58*, so they hold a sharper edge and resist rust, stains and corrosion. The beautifully designed ergonomic handle is constructed of 18/10 stainless steel, which features a "metal pearl" that demarcates the end of the handle and also acts as a thumb rest for better control. The transition from blade to handle is seamless which make it very easy to clean and more hygienic. The blade of each knife is carefully sharpened by the hand of a master so you'll enjoy it's super sharp cutting action the moment you try it. The ergonomic design provides maximum comfort and allows for superb weight and balance. Type 301 knives should only be sharpened with a whetstone, such as the Type 301 whetstone or a ceramic sharpener. Sharpening with a whetstone is so simple that even beginners can quickly master the technique required. Do not use metal sharpening steel as they will harm the blade. Only use wooden or plastic cutting boards, never marble or glass when cutting with a Type 301. Always wash by hand.